So. Protecting the Leuser ecosystem. Protecting an area of 2.6 million hectares. Protecting 105 mammal species, 382 bird species and 95 reptile and amphibian species. Protecting the lives of more than four million local community members. Protecting this all against major threats like deforestation, illegal encroachment and poaching. How do you do that? When I came to Aceh, I wanted to figure this out. I knew beforehand that there are many NGOs working in Sumatra and in Leuser, including HAkA (‘Forest, Nature and Environment Aceh’) and FKL (‘Leuser Conservation Forum’). Both of these organisations are of interest for me, since their founders have won the Future For Nature Award – Farwiza Farhan (HAkA) in 2017 and Rudi Putra (FKL) in 2013. 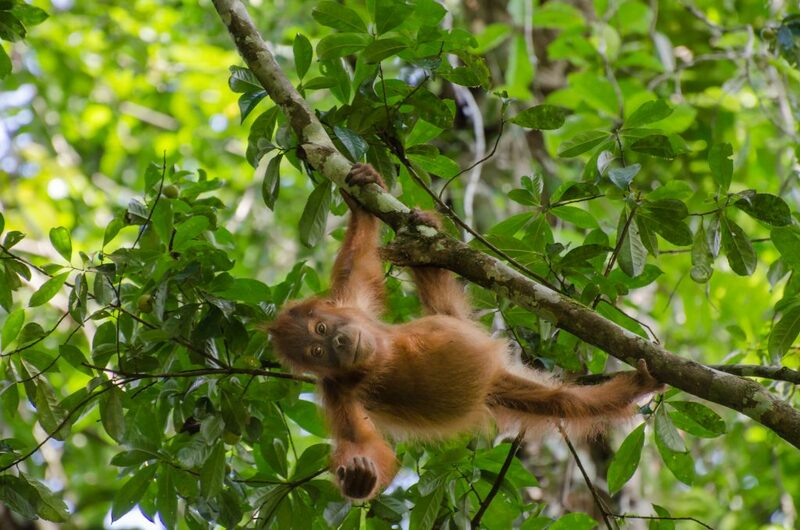 That’s right, Leuser is the only place on earth that houses two Future For Nature laureates. 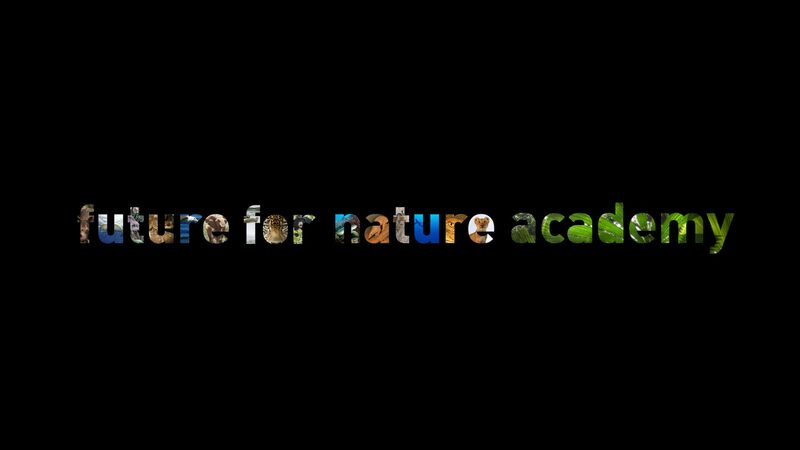 I already knew a little bit about Rudi and Farwiza and their organisations, based on what I’ve heard at the Future For Nature Awards. But this information could not help me answering my burning question. I mean, the Leuser ecosystem is massive and the threats it’s facing are really serious. But if there is one thing I have already learned on my journey, it is that conservationists are not afraid to commit to their ambitions, even if they seem farfetched or impossible for normal people. Instead of giving up, the organisations of Farwiza and Rudi are fighting even two fights at the same time: one mainly outside Leuser and the other on the ground of the forest. And they perfectly complement each other. With the enormous pressure big commercial companies are putting on the ecosystem, you can understand that in order to save the ecosystem, it is crucial to combat these threats. HAkA does that mainly in the legal domain. Because the Leuser National Park -which comprises about half the area of the Leuser ecosystem- is protected by law, major economic activities inside the area are officially prohibited. Still, palm oil companies set up their plantations, illegal logging activities take place and poachers are active in the forest. Enough reason to sue them. Which is exactly what HAkA does. Besides that, HAkA raises awareness among the people to show that unacceptable things are happening in the precious Leuser. One of their current big campaigns is addressed at a palm oil company, PT Kallista Alam. A couple of years ago, this company burned down peatland forests in the Tripa peat swamps in the northwest of Leuser, to make space for palm oil plantations. Because of this crime, the company was ordered to pay a fine of 26 million US dollars. Until today, no single dollar has been paid and the company is even about to receive legal protection(!). This was enough reason for HAkA to set up a large campaign, including a petition that has been signed over 100.000 times. Another campaign HAkA is working on, deals with the construction of a massive hydropower dam. The installation of this dam will have a detrimental impact on the area, not only on the animals but also on all the local communities living in that area. Soon I will join conservation hero Farwiza on a trip to the Tampur area, where the project is planned to be set up. When I’m there I will report on the region to show you why putting a hydropower dam here is particularly a bad idea. Of course, these campaigns and lawsuits are already a huge leap forward in the preservation of the Leuser ecosystem, but you also have to tackle the illegal activities where they have the biggest impact: in the field. This is where Rudi and his team enter. Currently, FKL has a team of over 100 rangers, divided over 25 Wildlife Protection Teams. 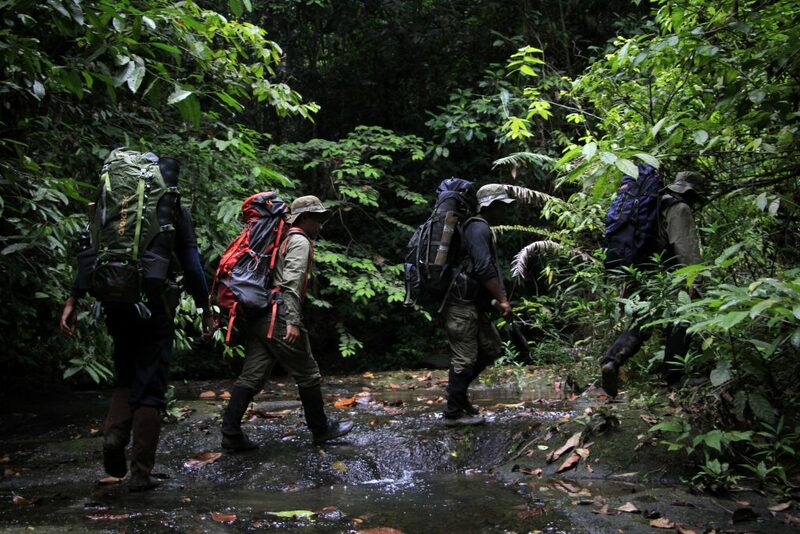 These teams patrol around the key habitats of the Leuser ecosystem to tackle any illegal activities taking place in the field. These include illegal logging and road building, poaching and forest encroachment: the illegal acquisition of forest areas to convert it to another land use. If anything is encountered, the rangers report the crime to law enforcement organisations, who will arrest the criminals. Because spending your time fighting crime in a biodiversity hotspot is obviously not enough (! ), the patrol teams are also engaged in wildlife monitoring. During their patrols, the rangers also look for (signs of) wildlife and check camera traps. With so many special and (critically) endangered species roaming around the area, it’s crucial to keep an eye on them. And the rangers know how to do that. Even the smallest sign of wildlife is observed by the keen eyes of the patrol teams. In a lot of cases, conservation NGOs only have the means and resources to focus on either field work or creating awareness, but almost never on both simultaneously. The fact that HAkA and FKL are able to do this, is rather unique and has been proven to be very successful the past years. One of the reasons why Leuser is worth saving. This photo is a small preview of what you can expect of next week's vlog. Given all the time and energy HAkA and FKL (and many other NGOs) put in protecting Leuser, there obviously is a lot at stake. This blog already showed you some of the reasons why Leuser is worth conserving, but I think there’s no better way of explaining you the importance of this area than by actually showing you the rainforest and everything in it. And that’s exactly what I will do next week. I have spent the past week in the Leuser ecosystem, with the aim to dive into its beauty and to experience myself why this area is so important for both man and nature. Next week’s video will show you my experiences of that amazing journey, together with the many reasons why Leuser is worth conserving. Enough reason to look out for the next report!